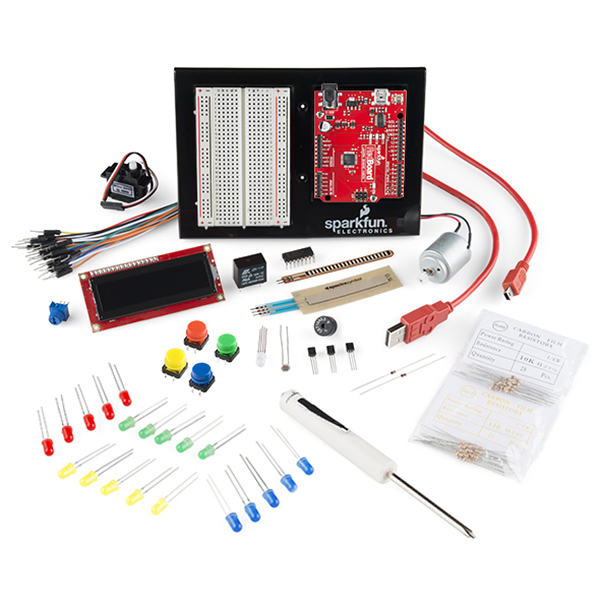 The SparkFun Inventor's Kit (SIK) is a great way to get started with programming and hardware interaction with the Arduino programming language. 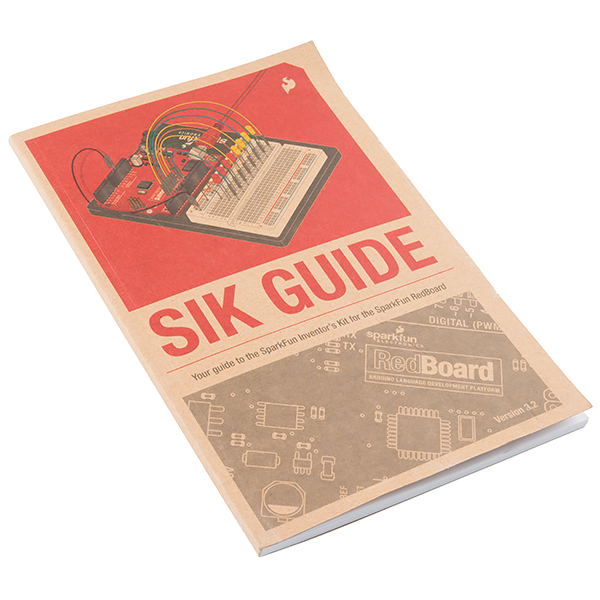 The SIK includes everything you need to complete 16 circuits that will teach you how to read sensors, display information on an LCD, drive motors, and more. You don't need any previous programming or electronics experience to use this kit. The kit does not require any soldering and is recommended for beginners ages 10 and up. Unfortunately, the mold used to create our SIK carrying cases broke during their last production when it moved from China to the United States. 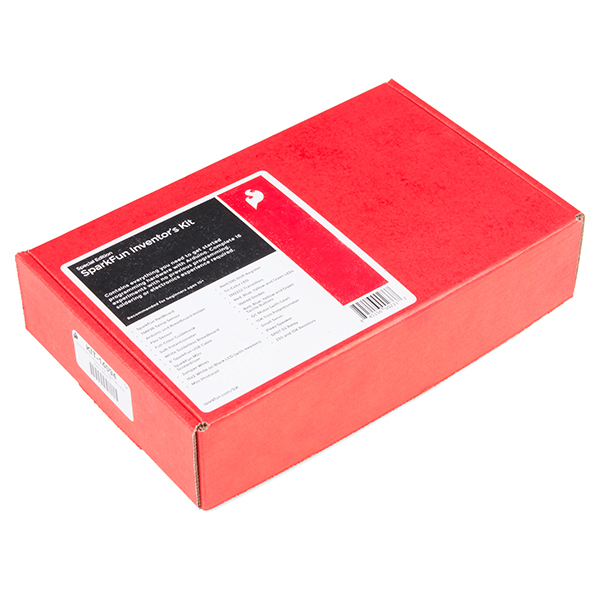 Therefore, all units of the SIK Special Edition will not have a the normal carrying case when you receive them, but instead one of our tried and true red boxes at a reduced price. However, anyone who buys this special edition SIK will receive an carrying case, in a separate shipment at no cost to you, when we have cases again. This creates the perfect opportunity to buy one of our classic SIKs at a reduced price without losing anything! Note: All orders of this special edition will get a case shipped To the same address, at no cost, when the supply situation is resolved. Tentatively, this means cases shipped to you by March. Custom security system so that nobody can enter your room without permission. Using an Arduino board to monitor fluctuations in body temperature to determine mood and then tweets based on your mood range. Perfect introduction and they learn it on their own in their own time allowing class time to be focused on projects. Purchased my kit to take part in a "maker" class. This kit was packed nicely--with several introductory "gizmos" that I'm still pleased & surprised were included. And the documentation is VERY nicely laid out in an easy-to-read format so that it's easy to follow the instructions as well as easy to understand the lesson. I'm very impressed with this kit and will recommend it and/or buy it as a gift for others. Very nicely done. PS I found it was easy enough to put an ethernet shield on my RedBoard to get it online. In my opinion, between SparkFun, Adafruit, and the Arduino sites, it's easy to find all the parts and instructions needed to extend these kits to wherever you need to take them. Simple, projects that do a great job introducing what the arduino can do. The package is very well put together and with the code examples really help step through and show both hardware and software examples. Really well thought out and presented! I bought these kits to use in teaching basic electronics and programming to 10+ year old children. The instructions are clear and most attendees had no problem following them without assistance. Sparkfun has put together a great kit at a great price. I highly recommend this kit over other kits. A well rounded kit for beginners. Has everything I need to start learning about Arduino programming. My ultimate goal is to build a programmable camera slider for my DSLR. This kit is a great start. the SIK guide ended up being wrong for experiment 15. It took a bit of research on why the display didn't show anything. I Found an alternative wiring setup which I used to test, and then modified it to add back in the trimpot to fine tune. Combining that code with the SIK code, and I got a lot more functionality. The breadboard refuses to hold the resistors & diodes included with the kit tightly. If you buy the kit and have problems with any of the SIK projects, tap the resistors. They'll power up clean. There was a few questionable components in my kit, three dead LEDs for instance, but everything important for the experiments worked. I would have liked to see Experiment 7 & 15 combined together. It's neat to have the LCD display and the serial monitor working together. This is a great kit for learning about building circuits and programing the Arduino. The documentation is easy to understand with good circuit layout photos. I had a problem with one of the components in the kit but Ducan of Sparkfun took care of the problem very fast. It is easy to cut and paste parts from one sketch to another such as Temperature Sensor circuit #7 with LCD circuit #15 giving a sketch which displays the Temperature in both degrees C and F on the LCD. Of course the circuits have to be combined also. Would recommend this kit to anyone wanting to learn about circuits and programming the Arduino. Also, Sparkfun's customer service is excellent. The manual was for an older version so the diagrams did not match. It was a lot of hassle to make one LED operate. The dial was inoperable. The unit is way too big to install in any project that could benefit from an LED light. Spend 1/10 on a new raspberry pi zero and watch videos. Because the manual is outdated you will have to self-teach either way. The components seemed good quality. Have you contacted our technical support department @ techsupport@sparkfun.com ? I am sure they would be happy to set you up with a replacement for the dial that was not operational and help address the issue of the outdated manual. I agree with you that the redboard is a large unit compared to many alternatives out there. It's intended for people who want to start out doing solderless prototyping, really it's just supposed to be a stepping stone to more compact and powerful microcontrollers like the pro mini's and things like the Teensy. Quick shipping and great customer service! Hi, I was helping our teacher education department get this purchased. The customer service was great and the shipping was quick. I had to have them take the tax off since we are a school, they fixed that quickly and easily as well. I started watching a series of tutorials on Arduino programming and they suggested this kit, since they use many of the parts in the kit. So far it's been great fun learning while using the kit's components. After buying a few, we need more. We do have a new version available (we change a transistor and updated the manual to reflect that). Otherwise the same kit. We do plan on retiring that one as well once we get our cases back in so keep an eye on that. The product page should send you to the current version. Time to get started in programming! The included hardware makes exploring the capability of this microcontroller virtually effortless. By the time you have finished the exercises, you are ready to take on almost any conceivable project.